Within only the last hour, this statement has been pulled from the G4S North American website and no longer appears at the URL where it was posted originally. 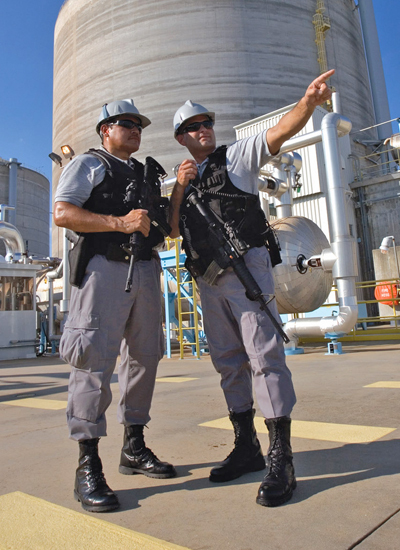 Securing Florida, where their North American headquarters resides, in Jupiter. Furthermore, though the assignment to which Omar Mateen was posted would seem to be fairly low level, another employee of G4S has confirmed that Mateen was an armed security officer. That's right! His gun licence and his firearm have almost certainly been supplied for him by the world's largest security firm with acknowledged ties to governmental, corporate, military and intelligence agencies and on the day he was carrying and using both an assault rifle and a pistol. "He was an armed security officer," said a spokesman, David Satterfield. G4S said in a statement that Mateen had been employed by the company since Sept. 10, 2007. Satterfield said G4S was trying to ascertain whether any guns used in the attack were related to Mateen's work. "A lot of that is dependent on what law enforcement is releasing," he said. An FBI spokesman said on Sunday that FBI agents had twice interviewed Mateen in 2013 and 2014 after he made comments to co-workers indicating he supported militant groups, but neither interview led to evidence of criminal activity. Satterfield said G4S was still gathering information on any contacts employees or the firm might have had with the FBI regarding Mateen. Two consequences of this information become immediately apparent, whatever you think about America and guns and its rights and its wrongs. Guns don't kill people. Brainwashed/radicalised G4S employees do. Firstly, gun laws would make no difference in this case because we can safely assume that British multinational security companies with responsibility for guarding everything from gated Florida-based retirement communities to nuclear facilities in Nevada would be exempt from them. Secondly, it must be asked how it can be that a man who has been 'on the radar' of the intelligence agencies, known to have associated with terrorists and/or Islamic extremists can have been allowed to work for the World's largest security company, in an armed capacity, to be given a gun licence and a firearm and neither the company nor the FBI have any problem with this. The official (now hastily removed) statement, from G4S makes it known that they had knowledge of the fact that Omar Mateen was indeed questioned by the FBI in 2013. Apparently, the FBI dutifully informed them of this fact. Did the agencies and G4S think it wise to leave this man in place despite the fact he was suspected of sympathies for violence and terror. He was 'screened' by G4S in both 2007 (when he was given a contract) and in 2013 (the very year the FBI questioned him). In 2013, following 'questioning' by the FBI over a matter the subject of which is not disclosed, the FBI's investigations were, to the public knowledge of G4S 'closed'. We are to believe that the one company with truly intimate ties with intelligence agencies were left ignorant of FBI's continuing concerns with Mateen and were told the investigations were 'closed'? G4S say this is what the FBI told them. Smells fishy, no? Why would the FBI not make global partner in intelligence operations, surveillance, crime response unit and armed security force, G4S, 'aware' that Mateen was still being investigated in 2014 and that he has been 'on the radar' of the FBI, under suspicion, presumably, of being, at the very least, a terrorist sympathiser, for the past 3 years? And in a turn of events that I personally find just a little chilling, it just so happens that one of the major beneficiaries of mass shootings just so happens to be, that's right, security companies. This article from 2012 for 'Security Info Watch' makes abundantly clear the fact that interest in armed guard services are 'up' following mass shootings in the US. There’s a perception out there that’s there’s more liability exposure that may or may not be true, but it goes back to the qualifications of the person you’re putting in those armed positions," he said. "Selecting a person that is a military veteran that has three years of experience as a military police officer and taking that person and training them to be a civilian security officer will carry a lot more weight and reduced liability exposure versus taking someone off the street, training them as an armed guard and putting them in that position." Another reason that a lot companies eventually decide that armed security is not in the cards for them is due to the fact that there’s simply less licensed armed security officers who cost more to hire than their unarmed counterparts. "An armed security officer, because of the higher standard and higher training involved, typically can be twice as much or more per hour than an unarmed security officer," Flint said. People are rightly wondering how it is that Mateen was able to shoot so many people in such a short space of time, with such precision and expertise. Well, if he's an armed security guard, he's been very well trained by G4S for such a task and may have had military training beforehand. Bobo adds that getting a job as an armed security guard with the company is difficult - not easy - because screening and vetting is very stringent and training is very intense. "The requirements vary state-by-state," said Bobo. "Typically, for an armed security officer, state regulations might require that the person be 21-years-old and they would require the person pass a background check investigation. In addition, they would require that person have completed training, and it’s anywhere for armed guards specifically, between 12 hours to 40 hours based on state regulations and that’s in addition to any additional requirements that might be setup for unarmed. So, it really varies across the country. Bobo said that G4S’ requirements to become an armed guard are much more stringent than that and that just because someone may pass muster for a state armed guard license doesn’t mean they will meet company standards. 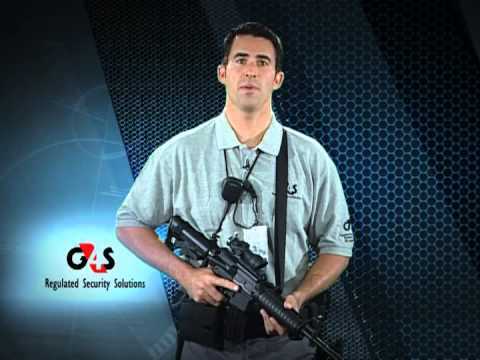 In addition to having to have prior experience in law enforcement or the military, Bobo said that G4S armed personnel undergo a minimum of 40 hours of training and that in most cases, they far exceed that. "It’s our responsibility as an organization to ensure that we’re putting the right talent in those positions," Bobo added. "Our guys are getting anywhere from 50 to 160 hours of training based on the particular organization’s requirements and what they need that person to perform." Clearly either something in the vetting and screening process either went very wrong - if G4S are innocent parties in this mass murder - or very right, if they are complicit. Either way, public knowledge of Mateen's employment by this truly massive and global surveillance and privately owned, very heavily-armed security firm needs to be broadcast loud and clear. I am yet to see this fact in the British press. In the ultimate irony in this story, is it really possible that included among the 'law enforcement agencies' who turned up to offer a rapid response unit to the mass shootings at Pulse gay nightclub in Orlando was G4S, the same G4S who, until late 2014, managed 'security' operations at...wait for it...Guantanamo Bay. This is the same company that 'secures' the US nuclear facilities in Nevada and the same outfit whose employee had suddenly gone 'rogue'? It goes without saying that given that G4S manage airport security in Europe and elsewhere, could it not be said that the company is overdue something of a public investigation into their employees potential roles in airplanes that explode in the sky? Or does nobody in Government think that is worthwhile? It is now being alleged by eye-witnesses that the 'off-duty' G4S gunman at the centre of this horrendous tragedy did not act alone. Helpers or colleagues, I wonder? May the victims of this attack rest in peace and their families find consolation from the Lord. May God come to the aid of the United States of America. G4S nuclear security guards. What could possibly go wrong? May God help and have mercy on us all. Thank you for this Bones. It seems we must now be our own news agency. Will pass this on. My understanding is that the nightclub is a smoke-free/gun-free zone. There would have been no concealed or open carry in the club that may have foreshortened the terror. Much the same for the carnage carried out by Derrick Bird in Cumbria in 2011, one or two armed citizens in the area might possibly have saved lives. It seems that many of these horrific mass shootings take place on soft targets. 17 things to know and share about the Orlando shooter. #1 According to the Director of the FBI, Mateen had links to al-Qaida, Hezbollah, and the Islamic State . #2 Mateen s father has openly expressed support for the Taliban on YouTube. #3 Despite those links to terror organizations, Mateen was allowed to work as a security guard at a local courthouse . #5 It turns out that this U.S. subsidiary of G4S is a company that works very closely with the Department of Homeland Security, the US Army, and federal and local law enforcement. #6 Mateen s ex-wife says that he would repeatedly beat her while they were married. #7 He started to become radicalized after separating from his first wife. While they were together, she said that he didn t show much interest in religion. #10 According to the FBI, Mateen has been on the radar before , he was interviewed by them three separate times, and they conducted a 10 month investigation of his activities in 2013. #11 He is being described as unhinged and unstable by his former coworkers. Farrokh Sekaleshfar a British-born doctor and Muslim scholar has gained a following by urging Muslims to get rid of homosexuals. And in April, he took his speech titled How to deal with the phenomenon of homosexuality to the Husseini Islamic Center in Sanford, just outside Orlando, Florida. #16 Hillary Clinton s State Department shut down an investigation of the mosque that Mateen attends because it unfairly singled out Muslims . If venues are going to have 'gun-free' zones, they should at least hire a full-time security guard to protect the patrons. That is a no-brainer that, for some reason, these club and establishment owners just can't seem to comprehend. Dembones, exactly. Those "gun free zone" signs that are so popular in libbie places are known as "unarmed victim zone" signs. For the record, Mateen's weapons were his own personal ones, bought at a local gun shop, whose owner has made public statements. Maybe Mateen is another Lee Oswald ? It smells......false flag?